Become a member of ZHPMafia today by clicking Here. The ZHP Mafia has an Amazon.com store. Read about it here. I'd like to introduce myself and my newly-acquired car. 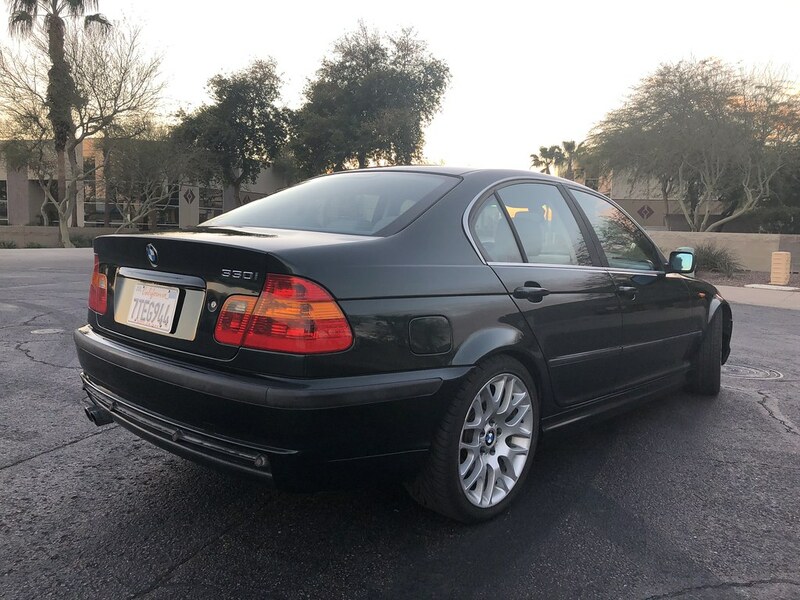 I'm a BMW mechanic/web developer living in Phoenix, AZ, with a strong love for BMW's from the late 90's and early 2000's. 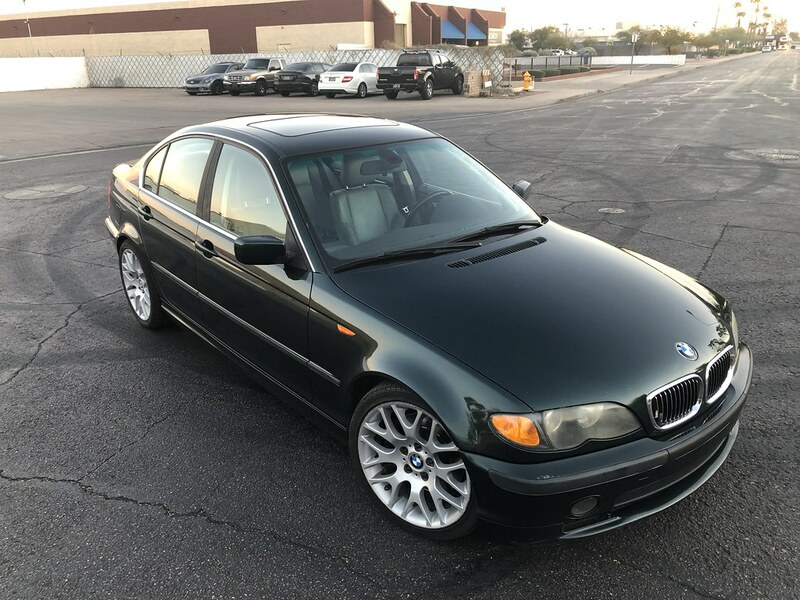 I've owned an E39 M5, half a dozen E39 540i/6's, an E38 750il, an E36 M3, a few Range Rovers, an X5 4.6is, and now I've got this, a 2003 330i/5 in Oxford Green. We agreed on a price over the phone and I booked my plane ticket to Sacramento for the following week. A 20 minute Uber ride later, I arrived at the seller's house. The car was exactly as described, no surprises, thankfully. Dario was super honest and I respect that greatly. The paint really pops in the sunlight! I had already worked out the price with the seller over the phone a week prior, so the transaction happened pretty quickly. 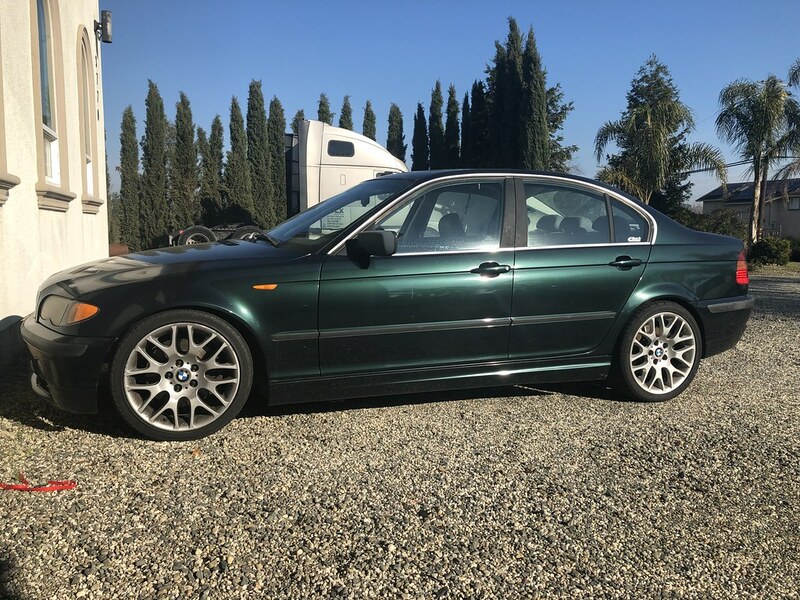 After that, I was on my way down to Fresno to pick up a set of seats for a friend, and I got my first impressions of the E46. 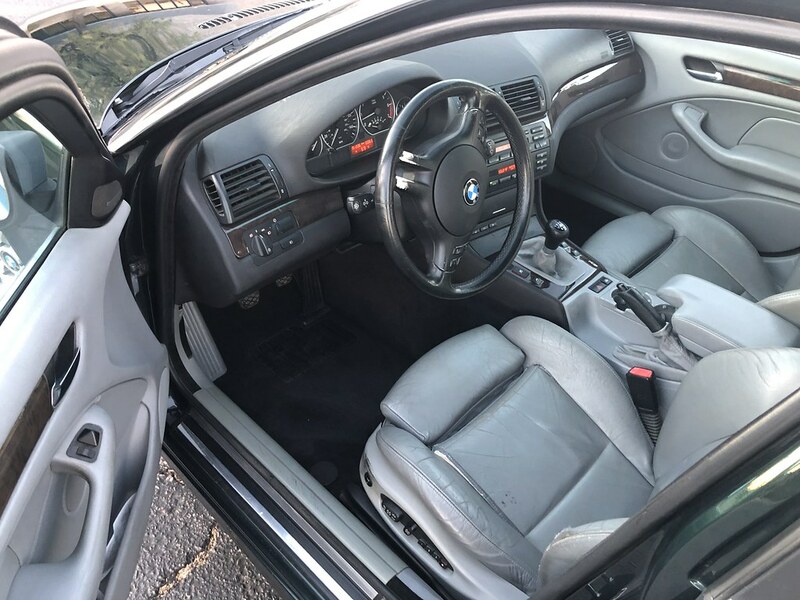 Compared to the E36 that I had been daily driving prior, it was much quieter at 80mph on the highway and much more refined overall. Having brand new suspension helped too! While I was in Fresno, I called around and got an appointment for an alignment + front wheel balancing at Firestone. They had a good deal going for the lifetime alignment so that's what I got. While the alignment was being done, I walked around and found a good burger place for a tasty lunch. On a side note, I love the wheels. 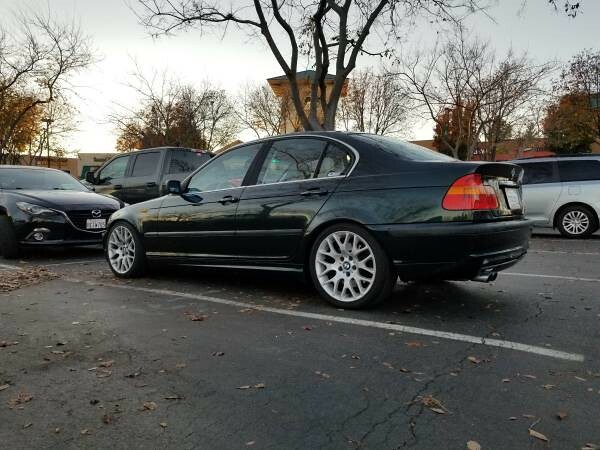 Usually I'm not a fan of cross-generational wheel swaps, but these E90 wheels look awesome on the E46, and the ride quality doesn't suffer as much as I thought it would, given that they're 18's. 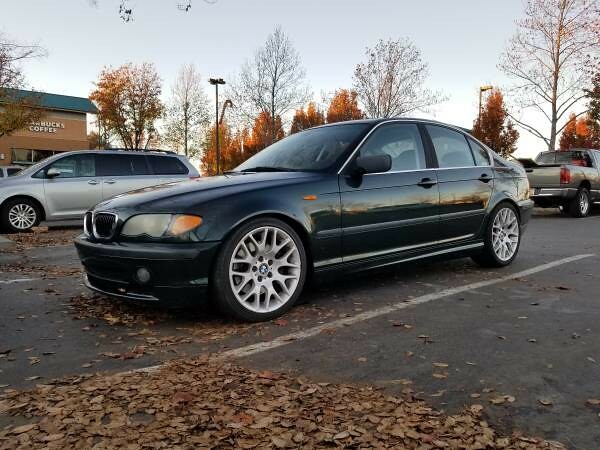 Part of why they look good is because they kinda look like chunkier CSL wheels, haha. 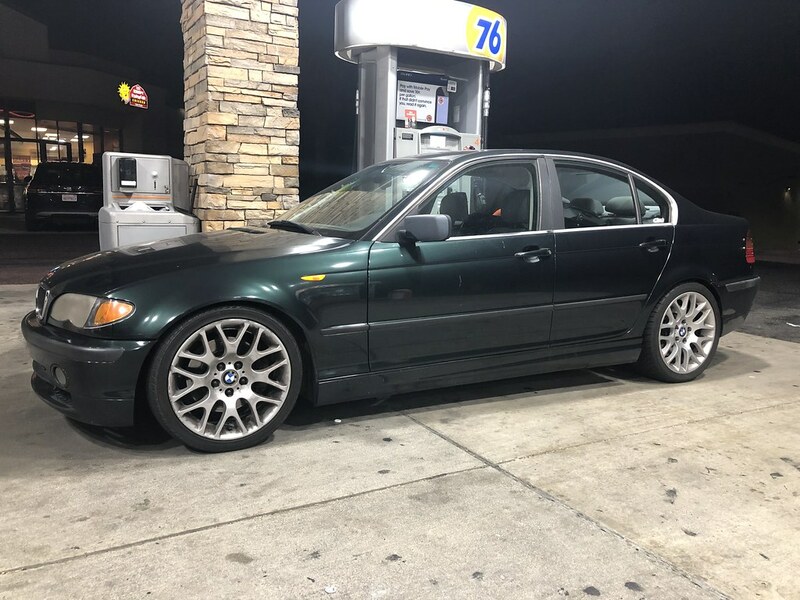 After the alignment the 330i drove a whole lot better. It'll still need new front tires very soon, but I was able to drive home much more comfortably. 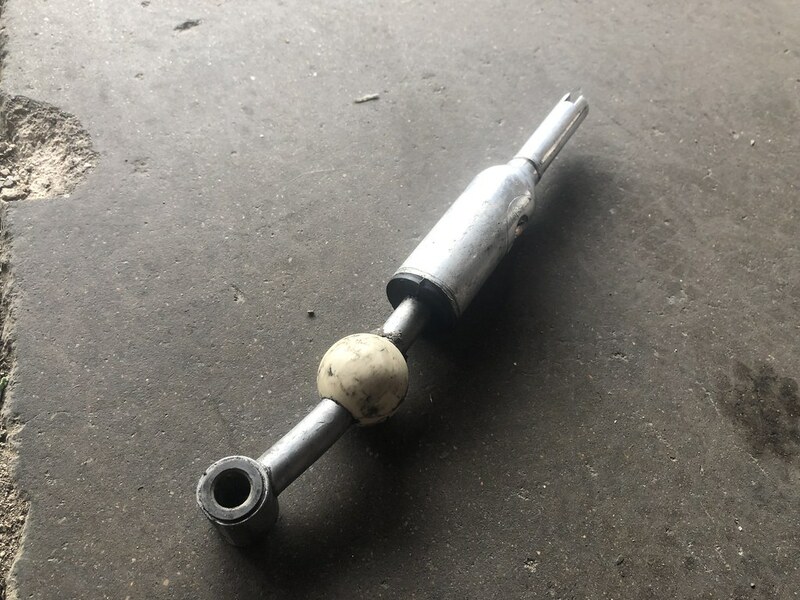 The only nuisance at that point was the short shifter, which was from some 330d and was way too low so it scraped the driveshaft when shifting. I'll have to replace that soon. The sound system sounded pretty darn good, especially with the aftermarket subwoofer in the trunk. My drive home was just an endless medley of pop punk and metal, good times. I averaged 28mpg (calculated at the pump), not bad at all considering I was doing 80-85mph the whole time with no real overdrive gear. I snapped another pic of the 330i at a gas station close to the Arizona border. You can see the main visual flaws of the car— the foggy headlights and the primer gray mirror cap. Both are easy fixes though, so I'm not too concerned. One awesome thing about the E46 is the headlight output. Coming from a whole bunch of E39's and an E36, the stock headlight output is just fantastic. 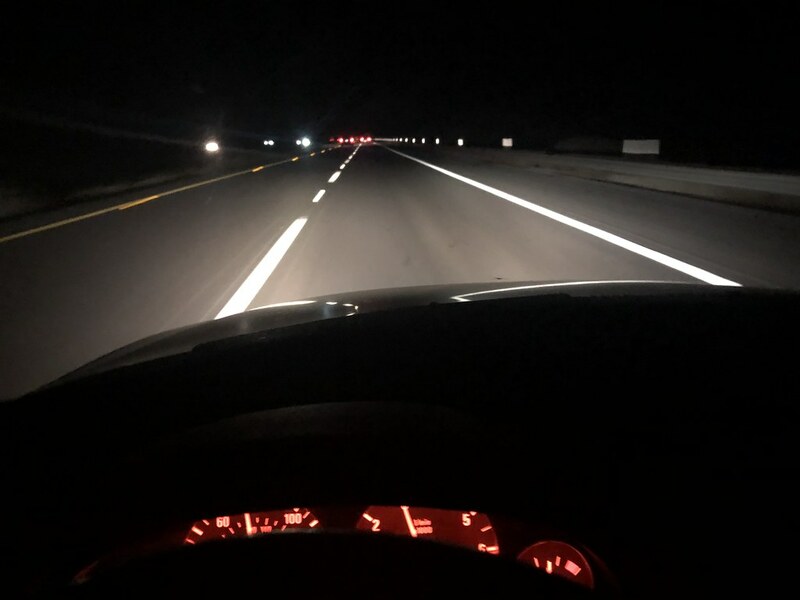 I could actually see ahead without needing to use my high-beams nonstop, which was definitely a novelty for me. 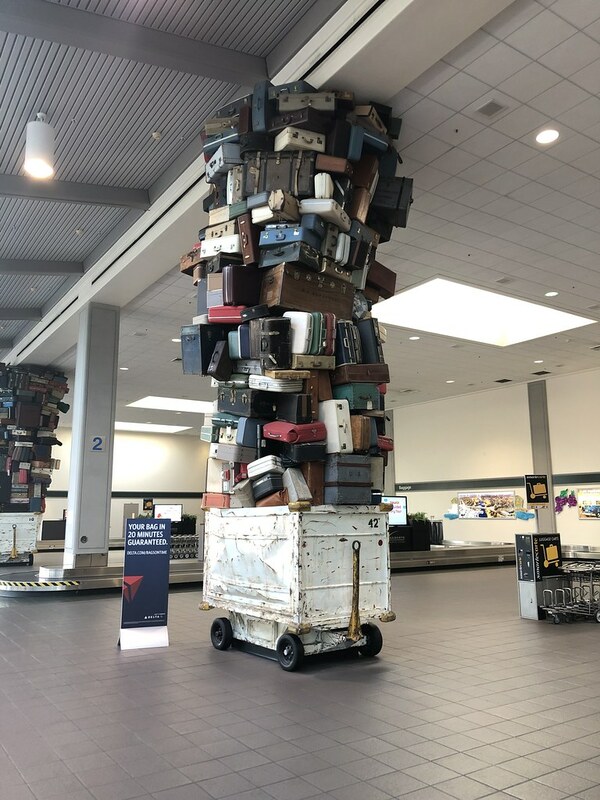 I made it back to Phoenix around 1:30am with no issues. The car was just a champ, eating up mile after mile with no qualms. 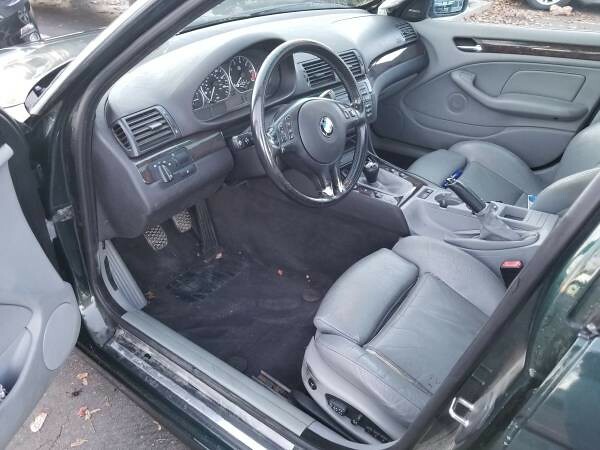 It reminds me of the good parts of my E39 (ride quality, insulation, creature comforts) without most of the negatives (poor gas mileage, heavy weight, heavy steering). In total, I drove 12+ hours from Sacramento to Phoenix on 5 hours of sleep the night before... and I did it all without a single drop of caffeine. 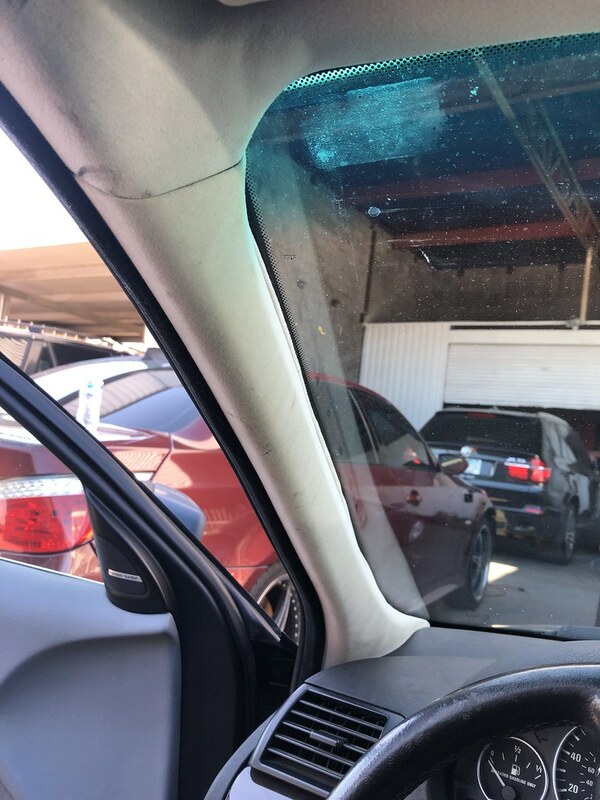 With the car back home, I could then proceed to my favorite part of car ownership— fixing things up and making it my own. 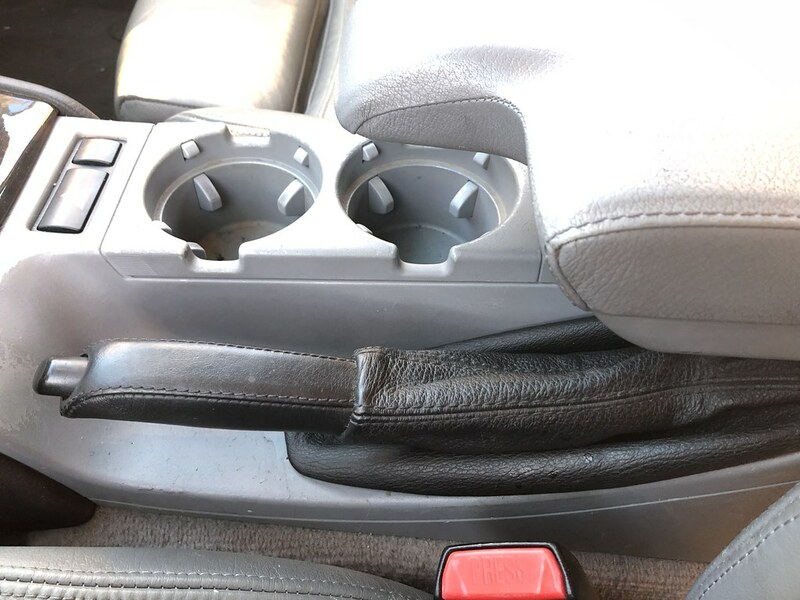 The first thing that needed to happen was installing an armrest... the previous owner had removed it so there was a big hole in the center console where it used to be. I happened to find an excellent condition one at the local junkyard for under $20 total, score! 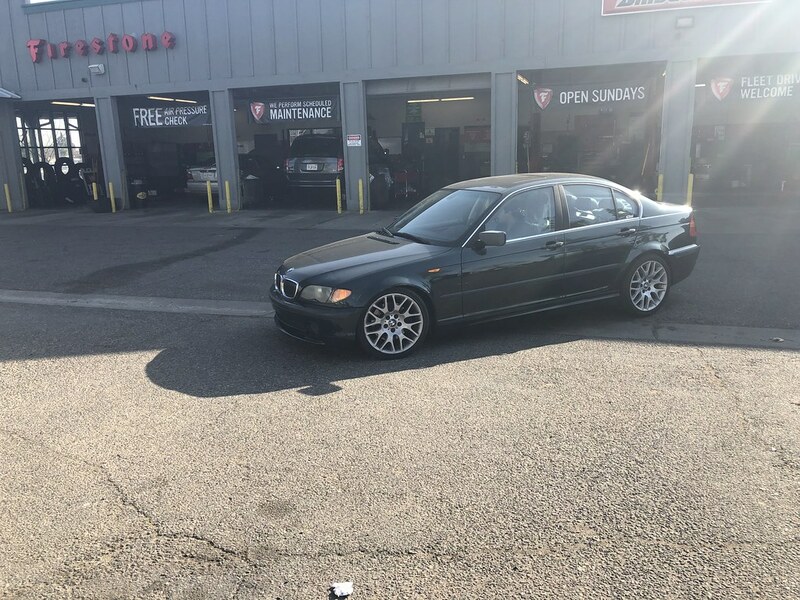 Installing it was relatively straightforward- I'm used to taking apart the interior from my experience with owning and parting out multiple E39's, and this E46 was no different. After the interior was sorted, we moved to the exterior. The wheels and paint were given a thorough cleaning with Ammo Plum + Ammo Brute on the wheels and Dawn dish soap on the paint (to strip any old wax). I used the two bucket method with the Grit Guard and a microfiber wash mitt, along with a power washer. After the car was clean, we went over it with a set of Meguiar's clay bars, which removed a surprising amount of dirt. The paint was quite rough when we started, and we got it to be pretty darn smooth. 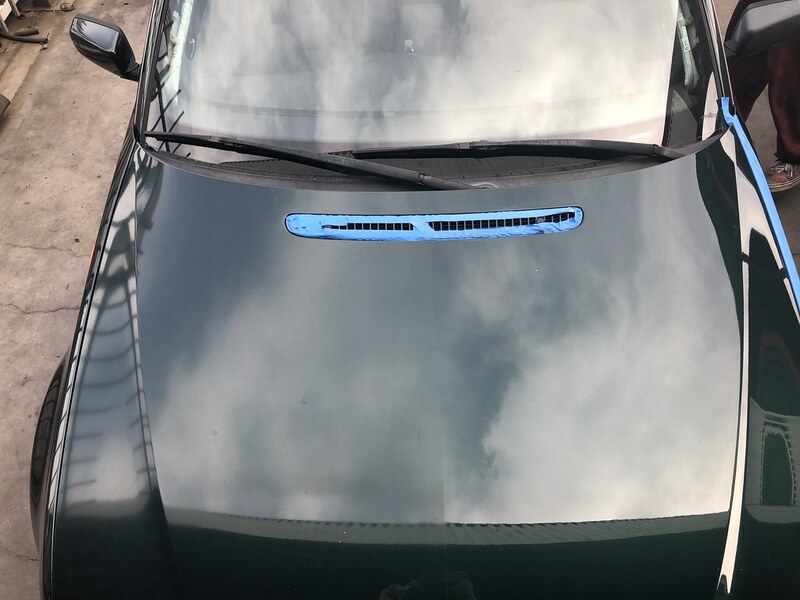 With the paint perfectly clean, we turned our attention to the hood, which was looking quite faded and dull from all the UV exposure (the car wasn't garaged from what I can tell). 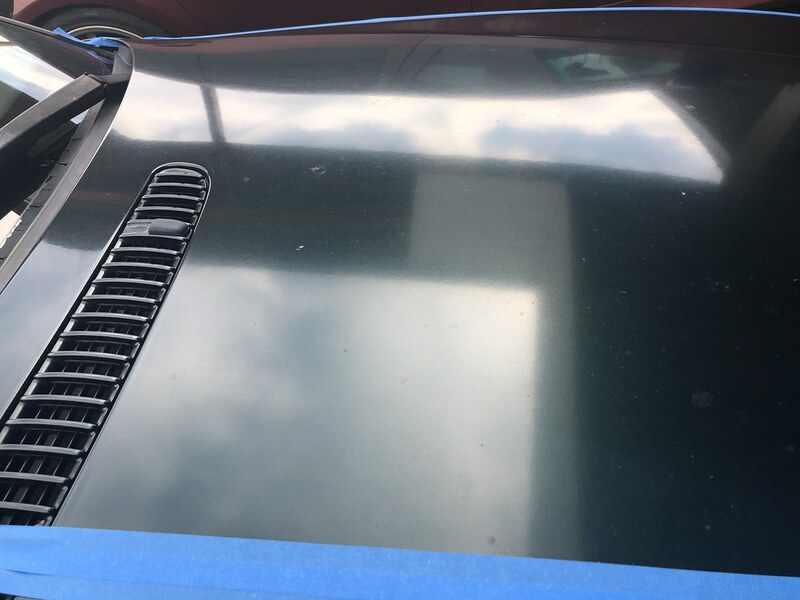 I did a quick test on the hood, doing one area with just Meguiar's M205 polishing compound and a microfiber finishing pad, and the other area with Meguiar's M105 cutting compound and a microfiber cutting pad. The polishing worked okay, but compounding gave the desired result, so that was the strategy we chose to go with. 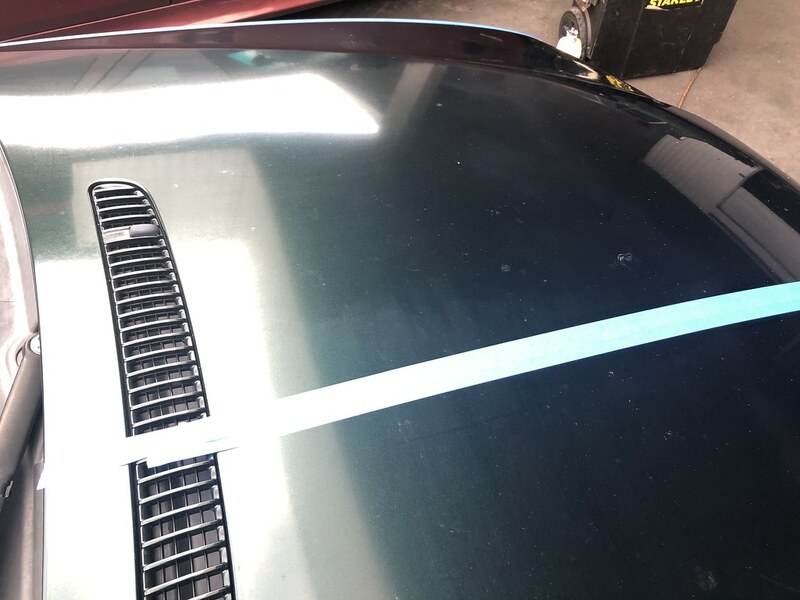 After an hour of hard labor, I had half of the hood compounded + polished, and pulled off the masking tape for the ever-so-popular 50/50 shot. It was quite the difference! After some more work, the rest of the hood was completed. 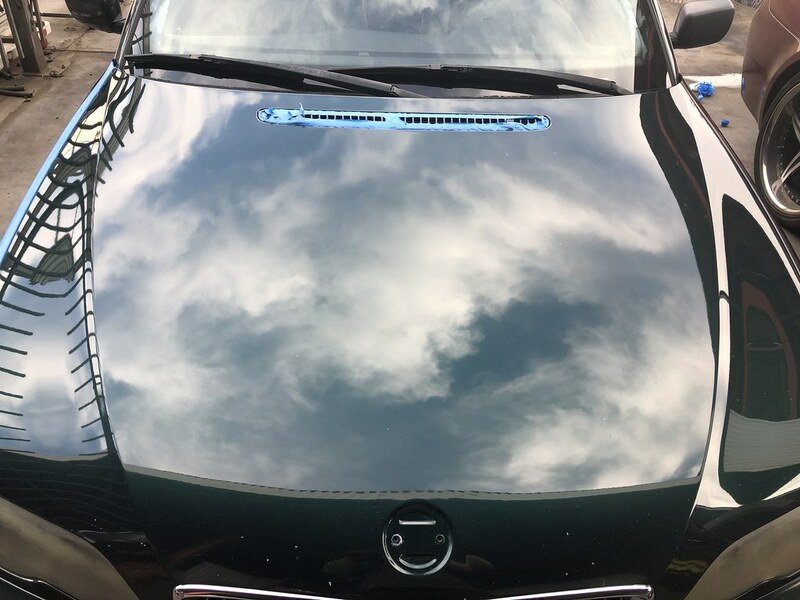 It looked amazing, especially considering that it cost nothing to do this (I had the polisher and all the materials from a previous detailing session). 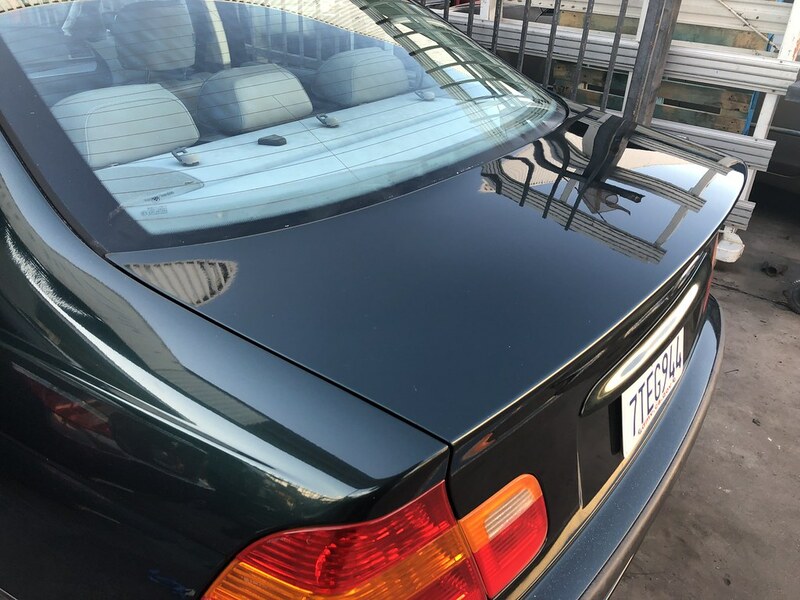 My friend compounded and polished the trunk as well, and it was quite the improvement. 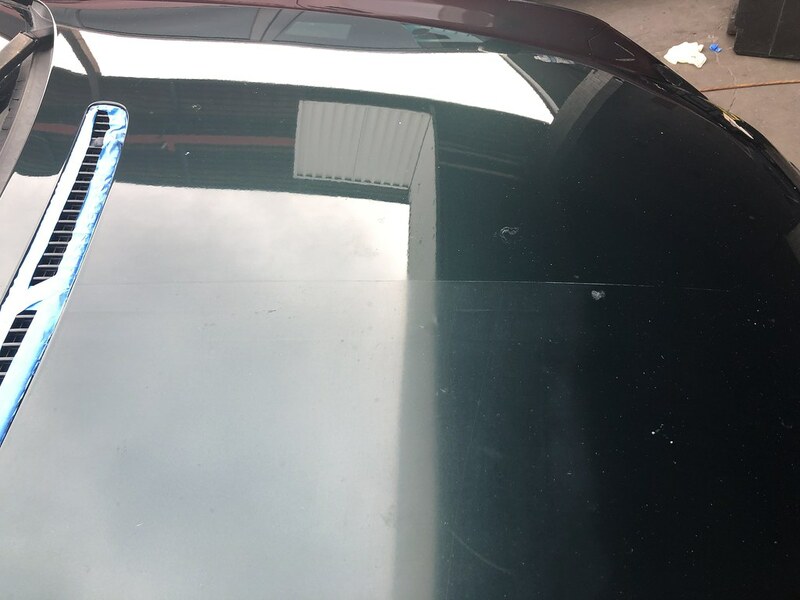 It wasn't faded or cloudy, but it had a lot of surface scratches from objects being placed on the trunk lid. I'm happy to report that 75% of those came out, and I'm confident that the rest would come out after some more cutting. 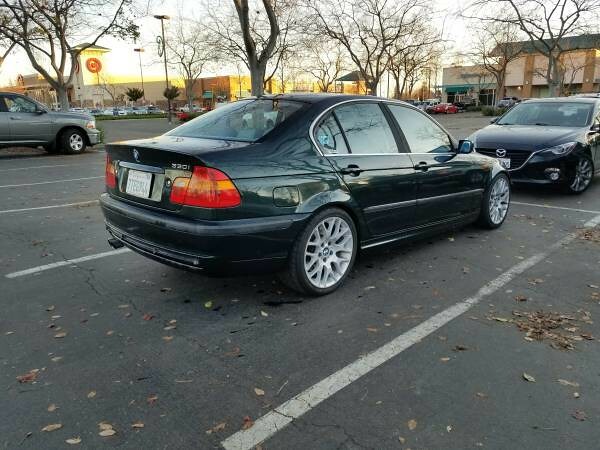 I wasn't aiming for perfection though, since this is a daily driver with 191k miles. By the time we were done, it was sunset, so I quickly cleaned up at the shop and went to a nearby culdesac for some beauty shots. 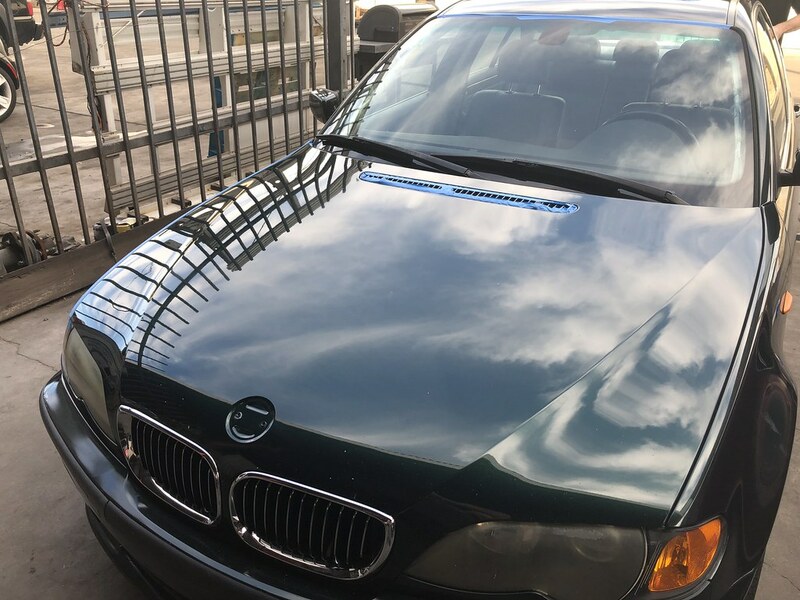 Yes, I know the headlights really need polishing, and I'll address that soon enough— I was pretty tired after a long day of customer work and polishing the car. The next order of business will be to restore all of the black trims. I'm waiting on new clips for the trims since I'm sure they'll all shatter the minute I touch them. 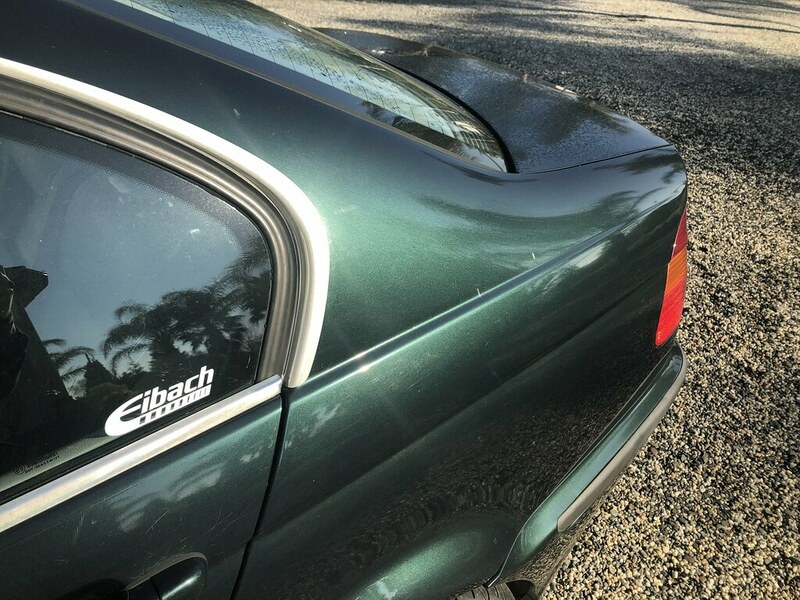 The rear diffuser has a bit too much sun damage to just restore, so I'll probably remove it and hit it with a few coats of SEM trim paint. The driver's side mirror cover is still primer gray, so at some point in the near future I'll get it painted along with the front bumper. One day I had some time after work so I headed out to the junkyard that's at the far west side of town. It took about an hour to get there, no thanks to heavy stop-and-go traffic. 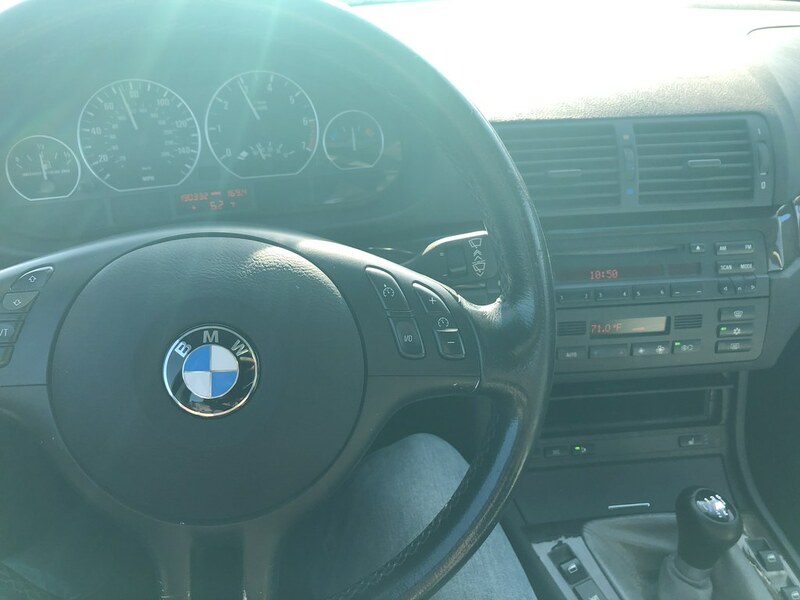 What's surprising is how easy it was to deal with the traffic— the clutch is nice and light, the M54 has plenty of torque, and the AC works great. 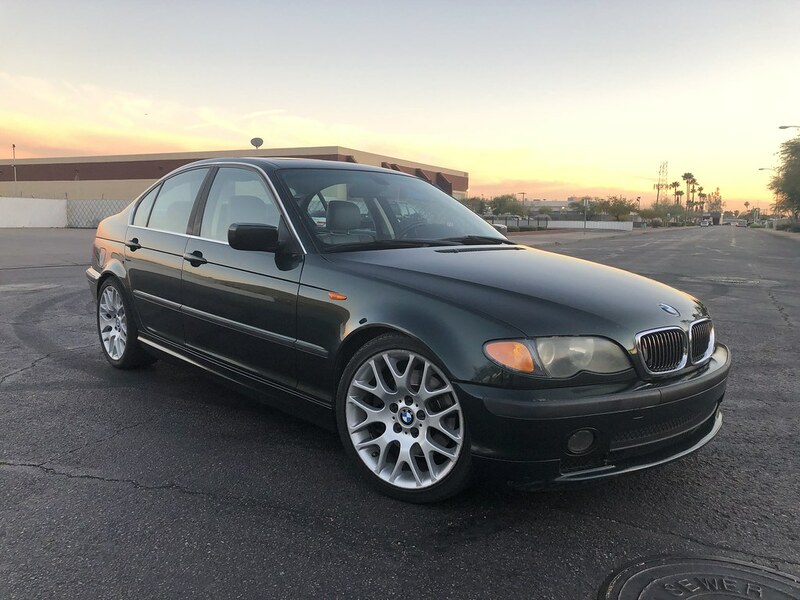 I've daily driven manual cars before but none were as easy to live with; the last manual daily driver that I had was an E39 M5 which just felt like overkill in every way. I didn't regret the drive at all though, because this junkyard yielded quite a few goodies. My main goal was to find a set of the OE Harman Kardon subs with their amp, since those were missing from my car. Literally two minutes into walking through the yard I spotted a red E46 with a black interior and a fully intact HK system, score! I also nabbed a black glovebox cover (which was still gray at that time), and a set of A-pillar trims. 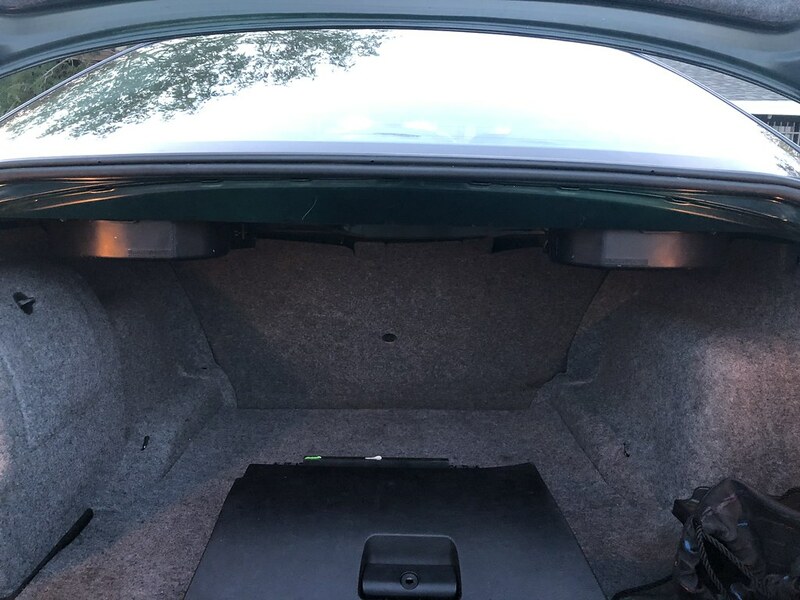 As I mentioned before, the car came with an aftermarket subwoofer, but after it started misbehaving I elected to remove it and go back to the stock HK subs so I could gain back the trunk space— I do a lot of grocery store runs, parts hauling, and junkyard runs in my car, so I couldn't have a sub taking up a quarter of the trunk, haha. 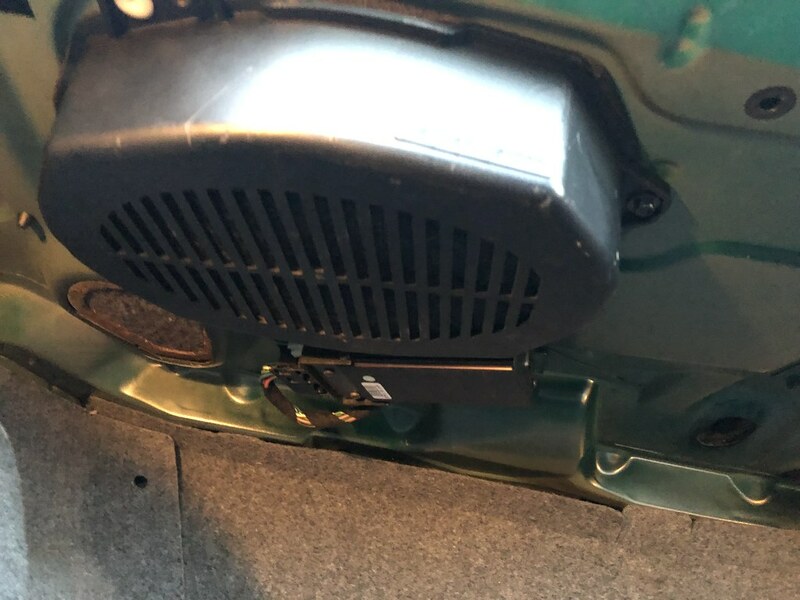 I installed the HK subs + amp in the parking lot of the junkyard since I was super excited and didn't want to wait. They worked perfectly and were plug and play since my car had the factory HK system. For stock little subs, they put out a good amount of low end, especially for the music I listen to (rock/metal) which doesn't require insane amounts of bass. The other day I did a little more interior work— I love doing little things here and there. 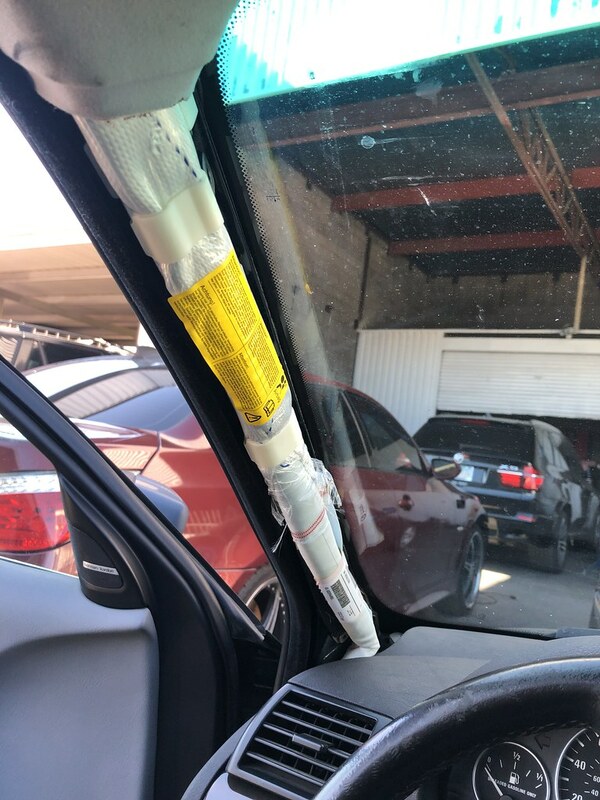 First were the a-pillar trims, which I reinforced with epoxy to keep them from falling apart as much. The fabric isn't in great shape but these will do for now until I buy some brand new ones. It's still quite an improvement from no trims at all, I'd say. After that, I installed the black glovebox cover. Super easy to swap over, and it really ties the black dash together nicely. 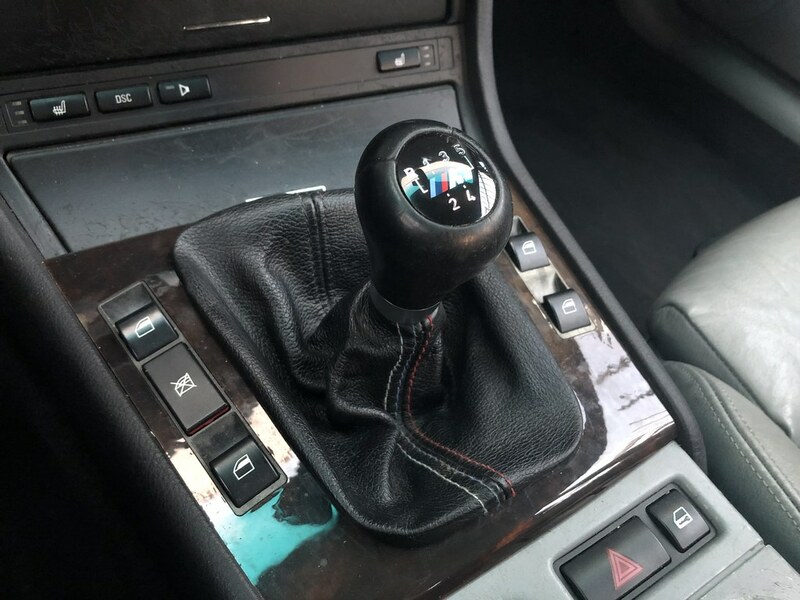 I found a black leather shift boot in a 325i at the junkyard, so I cleaned it up and installed it. The faded M-color stitching is a little cheesy but the knob was super cheap and it's much nicer than the dried-out gray original boot. During the most recent junkyard run I scored a nice condition black armrest, so I'll be installing that soon. 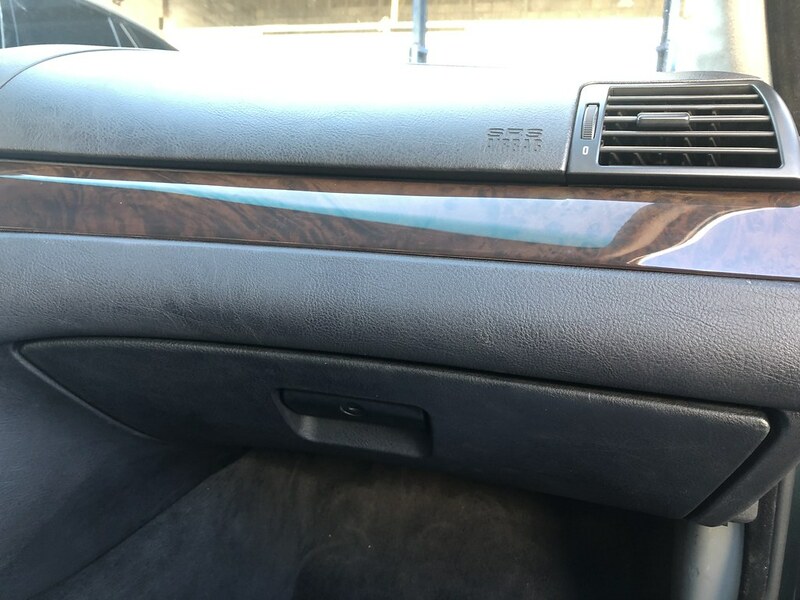 I put together a list of all the parts needed for a fresh black center console, and it's only $222 for Genuine BMW stuff (center console, ashtray, ashtray trim, cupholders, and coin holder). 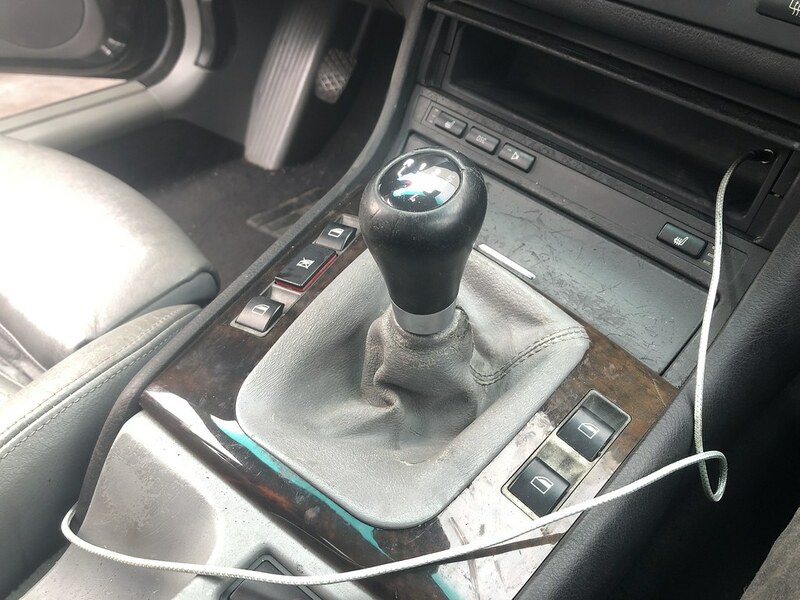 I think it'll be worth holding out for that instead of installing beat up parts from the junkyard— I can never seem to find a clean black console at the junkyard, they're all either peeling horribly or are cracked/broken. I also scored a black rear carpet, black lower b-pillar trims, black dead pedal, and a few other bits. Pretty stoked to install those once everything's cleaned up and prepped. 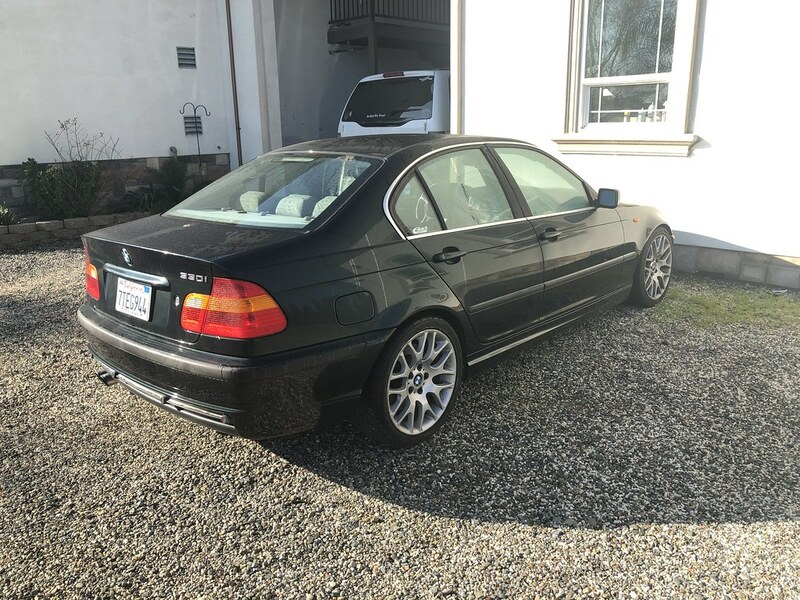 During the carpet swap I'll also be swapping in a set of E53 X5 4.6is black front seats, since my friend has them and they're in great condition. They've got all the same specs too— powered sport seats with lumbar support and heating. 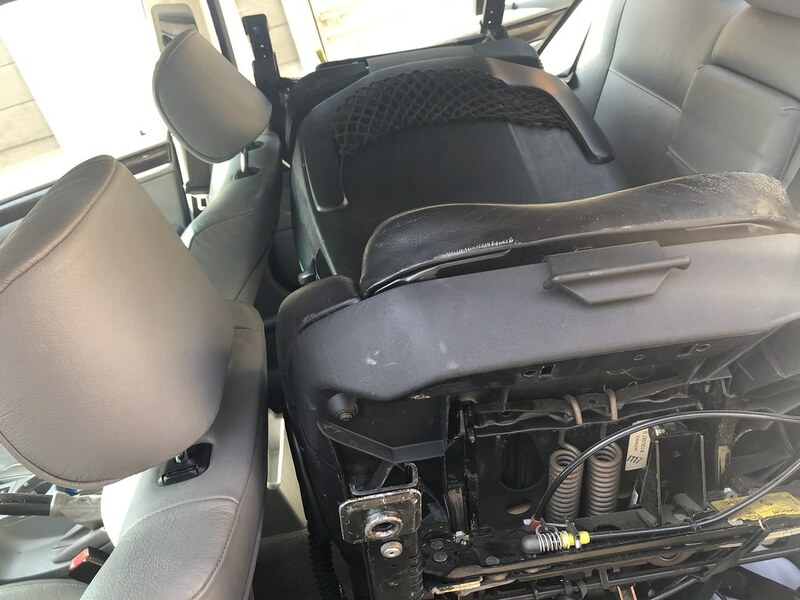 I thought I'd take it easy with the interior stuff and just live with the gray interior, but finding parts at the junkyard has just been way too much fun. Damn this was an awesome read. Glad to see that you're restoring an amazing color. I'll definitely be following along. FYI the peel-happy rubberized coating on the black console parts can be removed with hot water and a rough sponge. I did it on mine and it came out great. I'll edit in a link to the post when I get to my computer. Thanks for reading! I like to write about my cars a lot, haha. 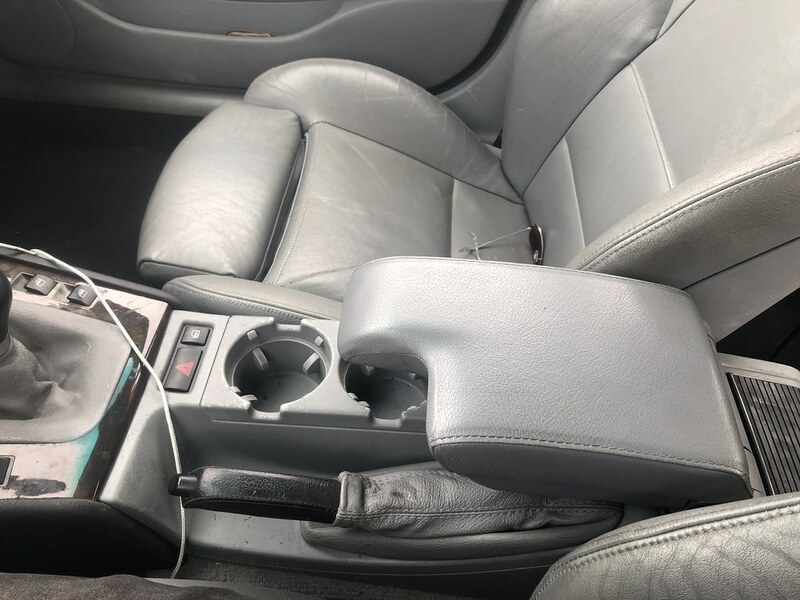 I've heard about removing the rubberized coating and I'll do that for the parts that are prohibitively expensive to replace, like the armrest assembly ($500+ new). 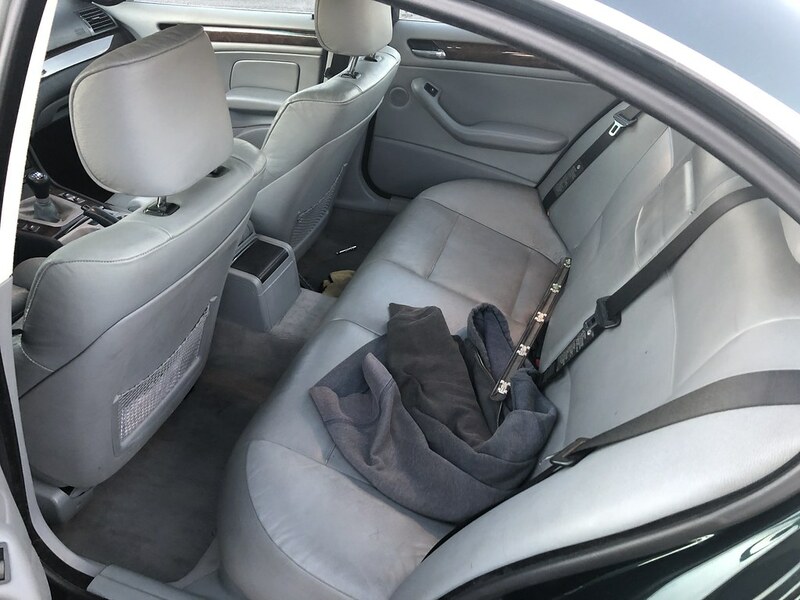 For the center console and cupholders though, the new parts are still affordable enough that I'll just buy them new and enjoy having a factory fresh look. Welcome. Wow, quite thw detail. And yes, we know Dario. Good to see his (former) car is in good hands. "ZHP or not, I still like you"
Welcome, sir. My 2005 Mini Cooper was Oxford Green as well ... Great color ! All times are GMT -8. The time now is 06:29 AM.